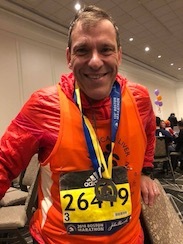 2 Dundee Park Drive, Suite B02-C.
CONGRATULATIONS TO MATTHEW PRESTON AND SILVINO (SAL) FERREIRA FOR THEIR SUCCESSFUL 2018 MARATHON RUNS!!! Anesi Products are researched, developed and manufactured at the Phytolab Laboratories in Spain under the strict German regulations. Starting with Organics, the ingredients are taken into the lab to create the smallest molecules to enable skin penetration. Whether you are new to massage or are an experienced massage and bodywork enthusiast, you will find the perfect session to fit your needs. Specializing in Therapeutic Hot Stone Massage, hot stones are incorporated into most massages (if you prefer, the stones will be omitted) - no additional charge. - Imagine as the hot stones relax your muscles, your Deep Tissue Massage becomes deeper without the pain. - If you are looking for a Swedish / Relaxation Massage, you will "melt" into the table. - Pregnant? 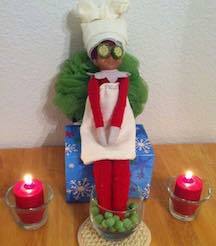 ...You do not want to wait any longer to call and set up an appointment for a massage! You will be treated as the Queen you are. 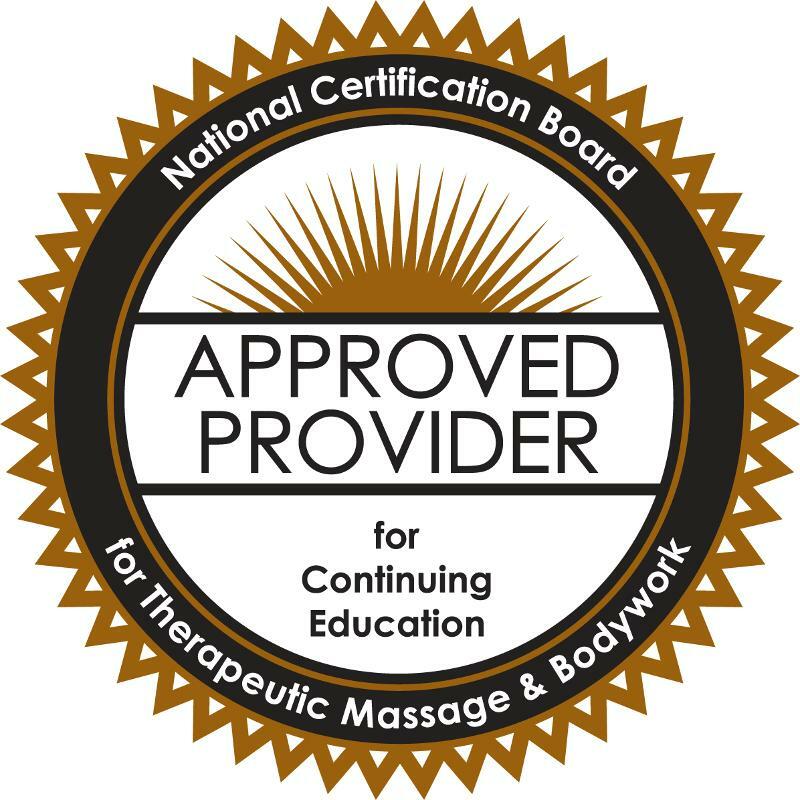 Certified in Prenatal and Perinatal Massage / Royal Pregnancy Massage Miss lying on your stomach? - I have a very special massage table body cushion just for YOU! 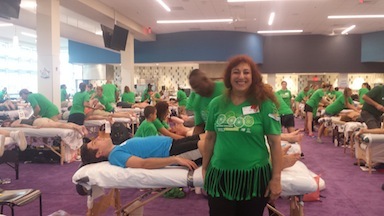 - The Sports Massage will focus on the main muscles of your sport and keep you in the game. Dundee Park - Building 2, Lower Level... Facing the front of the building, go in the first door on the right "Two Dundee Park" or if you need to use an elevator, go in the Main Entrance/middle door. Follow the signs to Diana Dow Massage/Suite B02-C.. 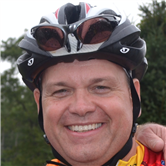 DONATE TO STEPHEN ANDERSON'S PAN-MASS CHALLENGE RIDE FOR DANA FARBER AND THE JIMMY FUND - Steve is from Andover, MA and has been a "Heavy Hitter" starting in 2013. 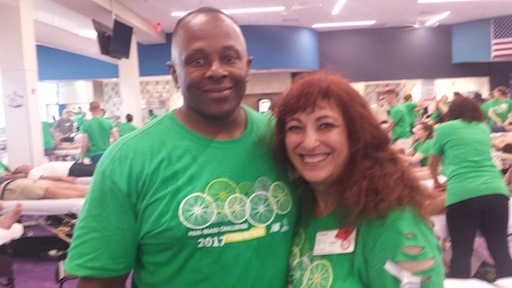 Henry Gibbs (pictured with me) not only is part of the Pan-Mass Challenge Volunteer Massage Team; but, also rides the second day. Please help support Henry's efforts - click here. Click on their names to support the Pan-Mass Challenge rides of Matthew O'Neil, Henry Gibbs, and Stephen Anderson. Thank you! UPDATE - Client RACHEL HYLAND did great at the USATF Half Marathon Championships in Columbus, Ohio on April 29, 2017 - She was in the top 20 winners. Rachel - you go, girl!!!! 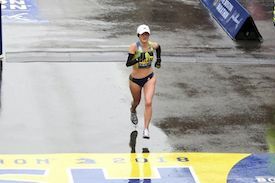 ROOTING FOR CLIENT RACHEL HYLAND WHO IS ON HER WAY TO THE 2016 U.S. OLYMPIC MARATHON TRIALS IN LOS ANGELES FEBRUARY 13, 2016. Since 2009, Rachel has been teaching Spanish and coaching cross-country and track, currently at Phillips Academy in Andover. Services by appointment. Flexible hours - Day and Evening Hours - INCLUDES Seven Days A Week Appointments. Call 617-823-2795 for an appointment. If you arrive late, your session may be shortened in order to accommodate others whose appointments follow yours. Depending upon how late you arrive, your therapist will then determine if there is enough time remaining to start a treatment. Regardless of the length of the treatment actually given,you will be responsible for the “full” session. Out of respect and consideration to your therapist and other customers, please plan accordingly and be on time. © Copyright 2019 Andover Massage - Diana Dow Massage and Bodywork. All rights reserved.